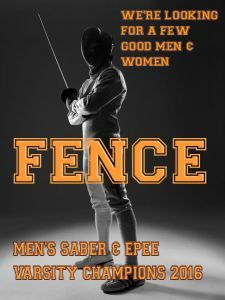 David St. George is a nationally rated epee fencer who eared his D rating in 2013. David also has experience with foil and sabre, but epee is his weapon of choice because he feels it requires more finesse and strategy. At the Division II & III Summer Nationals Qualifiers tournament, David qualified for both Divisions II and III, placing 6th in division II (field of 24) and winning 1st place in Division III (field of 13). David’s men’s epee team were the 2016 Conference Dual Meet Champions. Individual epee fencers Dave coached have won two gold medals at the JV Championships and a gold medal at the State Championship. Dave has coached the Men’s epee team to two back-to-back conference championships.